By Xah Lee. Date: 2018-09-16 . Last updated: 2018-09-17 . 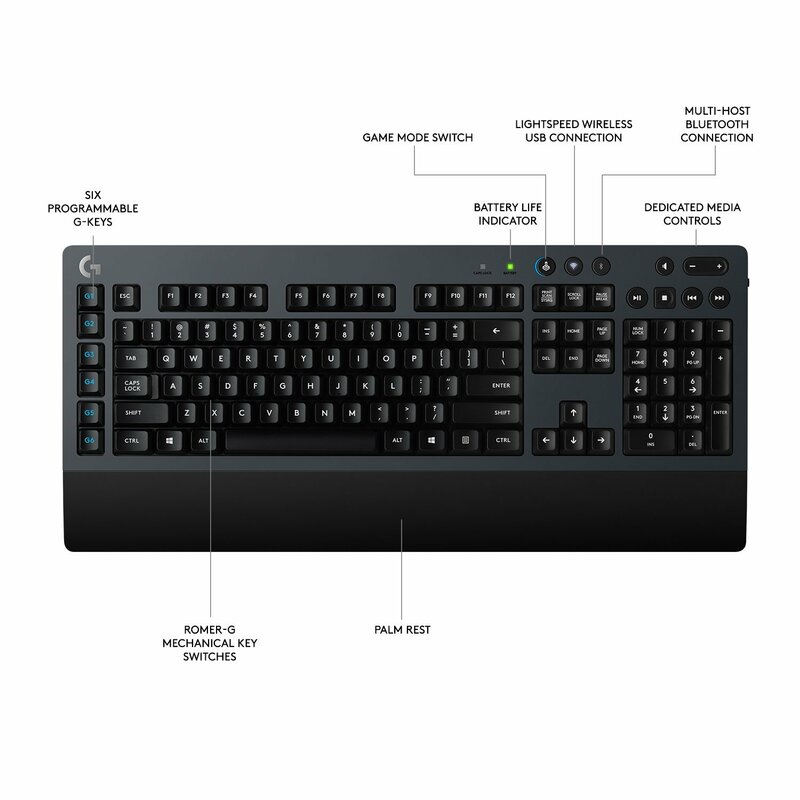 The Logitech G613 Lightspeed Wireless Mechanical Gaming Keyboard, came out in November, 2017. “LIGHTSPEED” wireless tech for 1 ms report rate. Supposedly, detect key press faster than some wired keyboard. Romer-G mechanical switches. These are similar to Cherry MX Brown, but quieter. 6 extra programmable keys (on the left side). The keyboard has onboard memory. Multihost 2.4GHz wireless and Bluetooth. Use either one. Or, you can connect to 2 computers, 1 with the wireless dongle and 1 with bluetooth. 18 months with 2 AA batteries. The wristpad is integrated, cannot be removed. This is pretty sweet. Wireless is especially useful. 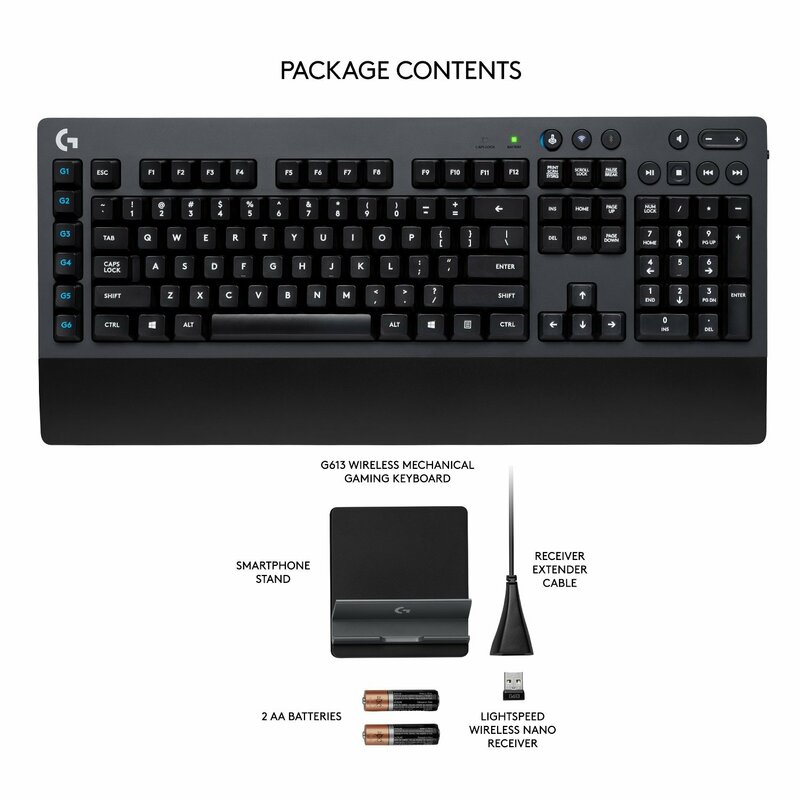 Not that many power multi functions keyboard are wireless. Would wish they have a sound wheel though. They got a seesaw switch instead. The 6 extrap programmable keys is great. For programers or office use, set it prev/next tab, close tab, prev/next window, or select all, copy, cut, paste. Also, it's nice to not have a Fn key. The Fn key are usually hardwired, so cannot be re-programed even via OS. So, it's like a dead horse squating in your front yard. In its place, the ▤ Menu key, you can use it as is or reprogram it.